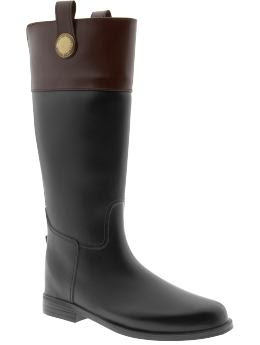 I am totally digging these equestrian style rain boots from Banana Republic. They are just as waterproof as your favorite wellies and just as stylish as your favorite leather boots! Forget Hunters...they boots should be your wet weather companion. These are great! My husband bought me a pair of leopard print rainboots with pink trim and doesn't understand why I won't wear them. I have no idea why he continues to think I like pink...I never have! I concur. Love these boots. Wow. Jill, I must see these boots, they sound intense! One the one hand everyone needs a bright spot on a rainy day on the other hand I'm not sure those are exactly office appropriate!